Of course I had help setting up and I'm no QB wizard. However, I know enough to properly track my efforts and create reports to make educated decisions based on actual data. That's the goal with QB, or a spreadsheet, or any kind of tracking. You want to take some of the guess work and risk out of your financial planning by using actual numbers instead of speculation. The first, and most fun category is Income. Sure I'm in this to grow food, but making money from growing and selling that food is the end goal here. The Income Category is broken down into sub-categories by operation. What you don't see here is that some of those sub-categories are broken down further into products. 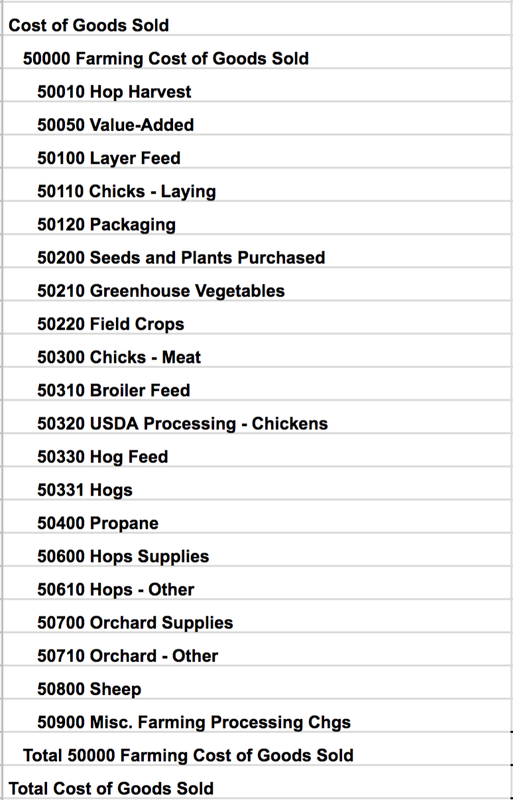 For instance, 40190 Pork contains all the sales information for pork chops, sausage, bacon, smoked hams, ham steaks, etc... All the different cuts of pork are products that count toward the total 40190 Pork Income. We split our tracking by operation because we want to be able to easily tell which products are making the most money for the resources invested in producing it. COGS are anything it takes to produce a certain product. For broiler chickens that's the baby chicks, the feed, the grit, and the processing. What doesn't go into COGS is the chicken tractor, the rent for the pasture, or the trailer used to drive them to the processor. Anything that goes into making your chicken, your eggs, your vegetables that you're only going to use for that one batch is COGS. When you take your Income and subtract COGS that gives you the number you're going to use to pay for all the other expenses on farm. CapEx are the big ticket items. Any large expense for your farm whether it's building a barn, putting together a cold room, building 24 chicken tractors, or putting up a greenhouse go into Capital Expenses. CapEx can have different tax implications than COGS can. With any and all of this is good to have a tax professional helping you. We can go into this in the future but I want to have my accountant on hand to make sure what I'm telling you is accurate and not just more internet half-science. Discretionary Expenses are anything subject to someone's decision-making. You choose to spend money on these items, versus something non-discretionary like rent, where it's due each month no matter what you think. Going through this Fix My Farm exercise I see that I might have some old categories in there that may belong in non-discretionary, or some categories that are old and should be deleted. I pulled up every category we have ever used, not just the ones that are current. Why differentiate between discretionary and non-discretionary? Why even have this category? Well, times on farm might get pretty lean. If you have a bad year and the income just isn't there than this is one area where it is the easiest to cut back and save some money. Organizing your expenses gives you the opportunity to exercise cost-saving measures in order to make sure you are being efficient with your money. The non-discretionary expenses are an important part of your budget. You have perhaps the least control over this category on a month to month basis. The rent, insurance, mortgage, etc... are going to be there no matter what you do. Changing these is more involved than say making a decision to spend more on marketing or to fill up the gas tank. 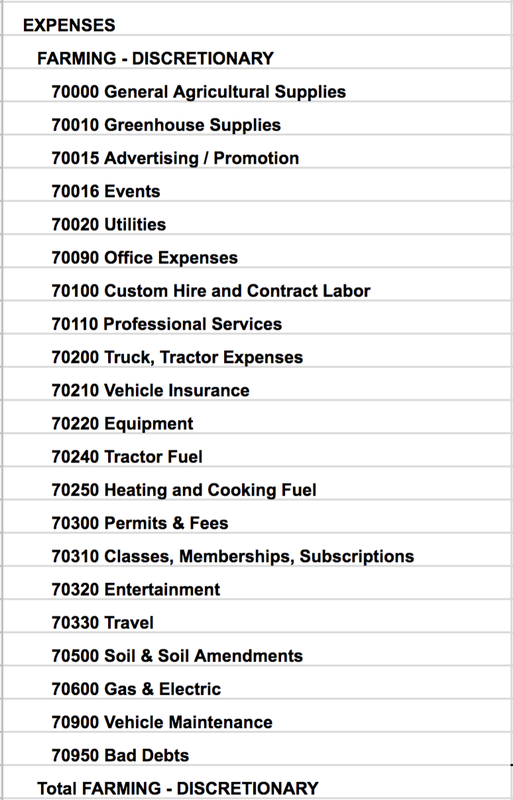 I could probably move "Vehicle Insurance" down here from the Discretionary column. As we start to talk more about farm budgets we're going to go over a minimum income amount. That's the lowest amount of income your farm has to generate to survive. If it takes $5,000 a month to turn the lights on, pay the mortgage, pay yourself, and put gas in the truck than the farm has to produce at least that in order to be viable. Payroll is always a fun one. There can be more layers to paying someone than you may realize before becoming the boss. This again is a good area to consult with a tax professional. When you're starting out there can be some cash under the table dealings going on. Where you hire someone cash and you avoid "the books" all together. That's only going to get you so far and if you do it too much it's hard to account for that missing money when it comes to tax time. The IRS doesn't necessarily like not getting their cut. We'll bring my accountant on here to discuss the difference between 1099, W2, W4, and K1. For now, just remember to pay yourself and your employees fairly. Here's the most important part, the bottom of the list, what's left after the smoke clears and the cards are down. Here's the number we are all working to improve, our bottom line. This is the discussion going forward. How much is the Net after everyone is paid? I'm not perfect, and neither are my QB categories. We change and adjust them slightly year to year as we find need. What I posted here isn't necessarily the way that is going to work best for you. What I hope to gain from sharing my information is that the conversation continues. I hope that whether you agree or disagree with the things I write, at least we're talking about it. There is plenty of information on the internet, on DVDs, and in books about "how to farm". All the growing information has already been published. Modern authors are just repackaging old information, myself included. Growing lettuce is not a new or novel concept. The "how to farm" conversation needs to include more of "how to survive as a farmer". There needs to be financial incentive for younger generations to get into farming. I am struggling with it right now. It doesn't feel great to know that my farm isn't viable yet, even after a couple years of trying my best. I know why it's not, but getting to the point of even cash-flow-neutral is going to be a struggle. Through my years farming I have found that learning what not to do is as important as learning what to do. If someone gave me a perfect farm plan and path to financial viability I'd still have to adjust it to my own situation. There is no perfect plan, and because there is no perfect plan we are all going to make mistakes. I have made my fair share of mistakes. My hope is that by being honest, sharing what I know to date, and swallowing my pride and ego a bit you will shorten your learning curve and get to a more sustainable place sooner. My heart and head are fully invested in the future of my farm and the future of farming in general. I have been very fortunate in the opportunities presented to me and I hope to pay it forward with each blog post and video I publish.